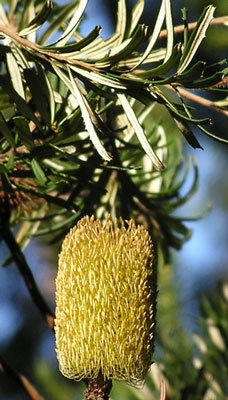 At 10cm in height, the spike (flower) of the Silver Banksia is one of the smallest in the family. 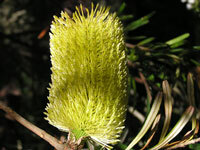 The Silver Banksia's straight styles distinguish it from the Hairpin Banksia. 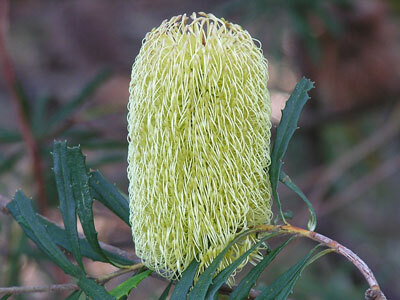 The Silver Banksia flowers from late summer to early winter, and can be found from South Australia through to Northern New South Wales, and Tasmania. 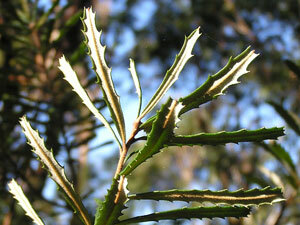 The name Silver Banksia comes from the underside of its leaves which appear silvery when the sun shines on them. The botanical name (B. marginata) comes from the edge (margins) of its leaves being turned in. The photos were taken in the Lane Cove National Park.